Are you looking to replace your car mats with cheaper or better WeatherTech alternatives? In all fairness, WeatherTech car floor mats are quite impressive and famous in the United States, but a little bit of change couldn’t hurt as long as you get the best car mats in the market and that’s where we come in. We will help you filter through some of the best WeatherTech alternatives and show you what there is to love and what’s not to like about the products. You can make a comparison and finally come up with something that is more to your liking. Before we start, it is important to note that a WeatherTech alternative has to be similar in shape, design, and material. 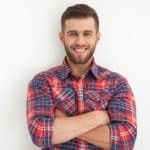 However, your main priority is finding a car mat that keeps dirt and debris inside because it has raised edges that fit seamlessly on your car’s floor area. You are welcome to check out our top picks below. 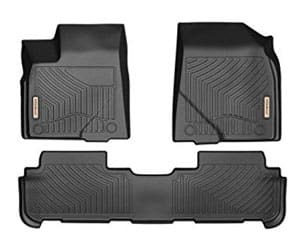 Husky Liners floor mats are manufactured in the United States and are made to be a custom fit for every vehicle depending on its year, make and model. You can trust in Husky products since they have been around since 1988 and continuously come up with new and improved products to suit your daily needs and to fit the design of the modern motor vehicle. Husky Liners floor mats and car liners are designed to extend the life of your car and to keep it protected both inside and out. The best part about Husky products is that they come with a lifetime guarantee. Husky custom fit car mats are designed with raised edges which contain spills. The lifted edges/ grooves/ diamond-plate pattern direct spills away from your car floor or carpet and into the liner. The liner is also fitted with STA-Put nibs that provide an anti-slip feature by holding the liner firmly in place. It is almost impossible to shift the mat with your boots while you are driving. Husky gives its users a wide selection of car mats to choose from depending on the construction. Whether one would like the flexibility of the X-Act Contour engineering or the rugged rigidity of the WeatherBeater, you can find something that suits your needs. Husky manufactures its mats from flexible elastomeric material coupled with rubberized thermoplastic. This feature makes the mats highly resistant to extreme temperatures and chemicals like gasoline. Husky also guarantees a lifetime warranty on its products so in case you notice a crack on your mat, you can take it back to the store and get a new one. Husky floor mats and liners look great and are very durable. They come with a ready-fit design for your vehicle and guarantee you a no-fuss and no –muss protection. Husky offers comfort and superb protection against mud, sand, snow, salt, and most harsh chemicals. An adorable feature is how the mats are soft to touch and yet are extremely strong. You could punch it, bend it and kick it and you still wouldn’t notice a single crack. In case it does, Husky has a lifetime guarantee so run back to the store and get yourself a new floor mat. Max Liner takes credit for the manufactory of Smartliner floor mats and cargo liners designed for cars, trucks, SUVs or minivans in the United States. Smartliner offers unparalleled all-weather protection and is also made with eco-friendly materials. The floor mats are designed with utmost care and precision to give a superb look to your car’s interior. The best part is the Max Liner offers a lifetime guarantee on its products. Smartliner floor mats provide first-class protection to your car’s interior and keep off those ugly stains and tear marks. The Smartliner impressively offers a precise fit for a wide range of car models in the market. A custom fit is what you need to protect your floor from spills, dirt, and debris. The mats are fitted with an elevated liner and strengthened with Spill Saver Lip technology that helps to keep soil and spills from ever coming into contact with your floor’s surface. The floor mat is flexible since its made from low-density materials that offer both elasticity and durability. You need not worry about the car mat slipping off when they are wet as Smartliner has a textured skid-resistant surface that keeps the mat in place and also makes it easy to clean them. The textured surface also enhances the visual appeal of the mats and make’s your interior look nice. The Smartliner floor mats are also stain-resistant meaning that neither dirt, mud, snow or salt water can affect the working mechanism or the look of the mat. Cleaning car mats can be a bit tricky and also a time-consuming process. The Smartliner is a good choice if you hate taking too much time in cleaning car mats and if you’d like a high-quality mat at a reasonable price. Yitamotor is a hi-tech enterprise based in Washington and is committed to providing high-quality auto parts. Yitamotor floor mats are guaranteed to completely cover your carpet and fit from edge to edge without leaving any gaps. 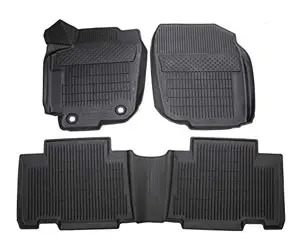 Yitamotor floor mats are made of TPE material which is odorless, non-toxic and contains no lead, cadmium, latex, leads or any harmful polymers. You are, therefore, guaranteed 100% safety even in extreme weather conditions. Yitamotor floor mats are made to be an exact fit for your vehicle with 3D laser scanning measurements. Additionally, to protect your car from any mess, the edges that run along the door jam are raised to ensure dirt and debris runs off. This raised edges, and unique design channels trap liquid, snow, mud, and dirt thereby keeping your shapes clean. The back side forms a non-slippery design coupled with fasteners and factory hooks that prevent the mats from sliding even in wet conditions. 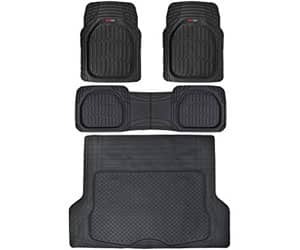 Yitamotor floor mats are made of heavy-duty rubber that is easy to install and remove for cleaning. These mats are perfect for cars used by children or seniors due to its non-slip feature. It is also effortless to clean as you can shake the dirt down or pray it out with a garden hose. Generally, it’s a good product that arrives in good packaging and has no strong odor. Kiwi Master is a trusted brand that offers automotive car accessories. The brand is committed to providing high-grade products that suit all their customer’s needs. A notable feature of Kiwi Master floor mats is easy to clean they are. No special cleaners or harsh scrubbing is necessary. Kiwi Master protects a vehicles passenger and driver’s floors. Its construction entails high-density TPE material that makes the mats resistant to stains and erosion from harsh chemicals like gasoline. TPE material is also non-toxic and odorless. These mats won’t melt in high temperatures nor will they crack when it gets too cold. You don’t have to worry about the mats moving when they get wet as they have special anti-skid nib backing that limits movement on contact and also prevents slipping. The anti-slip feature is also made possible with the help of factory hooks and fasteners. Taking the mats out for cleaning is even easier. Just dust them down with a soft bristle brush or wash the dirt off with a garden hose. It will be as good as new. Kiwi Master is easy to clean and comes at a reasonable price. They are quite similar to WeatherTech, and you only get them at a fraction of the cost. The mats may not fit the form of the car floor in the beginning, but they ease up to the floor design as they heat up. They are highly recommended for cars that carry the elderly or children and also if you are into muddy outdoor activities. 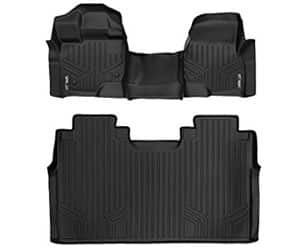 Motor Trend car mats and floor liners are manufactured by Custom Auto Crews which is a leading source for car accessories. Motor Trend car mats are designed to catch anything that gets in their way all thanks to deep grids and diamond ridges. Custom Auto Crews makes products regulated products that are odorless and BPA free. Motor Trend products are cheap universal floor mats that look quite classy for their price tag. You can depend on Motor Trend mats to provide top-notch protection for your car’s carpet and also make an older car look new on the inside. What’s more is that the mats come in a rather flat design that makes cleaning easy. You will love that these floor mats don’t give off a nasty or offensive odor that can trigger car sickness after they stay in your car for too long. You will have peace of mind when driving your vehicle, and it’s nice to know you won’t be slapped with a bad odor when entering your vehicle for the first time after leaving it out in the sun. These floor mats also come with craftily-engineered channels specialized for trapping dirt, spills, and debris so that your car floor won’t have to look like a total mess. Motor Trend car mats come in a universal size and have extended flaps that can be trimmed of with ordinary scissors to fit in your vehicle. Best of all qualities of the Motor Trend mats is the heavy-duty fabric construction that is resistant to temperature changes, which means that you won’t trace even a single scratch in the cold season and neither will it melt when the temperatures go up during summer. Motor Trend car mats and floor liners are odorless and give a warm and cozy feel especially during winters and whatever else Mother Nature has to throw your way. They are also amazing and a bargain in comparison to other WeatherTech alternatives. The problem is that they are not a custom fit but trimming them is easy. What are the best car floor liners? Do car mats fit all cars? What is all weather floor mats? Can you wash car floor mats that are carpeted? 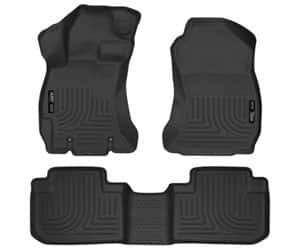 The best car floor liners despite WeatherTech are Husky Liners, Smartliner, Yitamotor, Kiwi Master and Motor Trend car mats as per our review. Unless they are universal, car mats do not fit all cars. Vehicles come in different models, and we cannot assume that one would fit all vehicles. Even the universal car mats require a little trimming to fit your car. 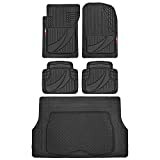 The best thing you could do is to search for a car mat by looking into your car’s year, make and model and look into all available options for car mats that fit that criteria. All weather means that the floor mats perform well in all types of weather conditions. During rain, the mats trap mud, water, and snow during winter. They also don’t heat up and melt when it gets hot. Yes, you can. Just ensure to vacuum first and spray the tough stains with a pre-treat spot remover. Then throw the mats in clean water mixed with detergent and use a soft brush to scrub out the dirt. We hope you will make an informed decision the next time you are out scouting for the best WeatherTech alternatives. Just go through the features of each mat and see how well they fit your needs and budget. You could also get different mats and change them depending on the theme you want to adopt for your car’s interior.